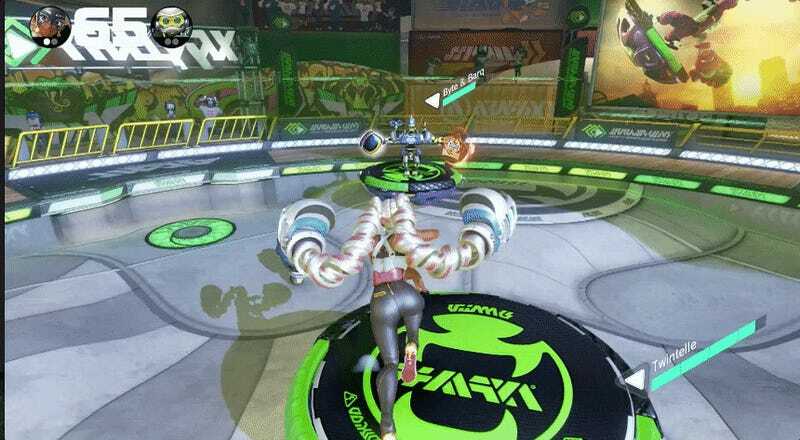 The Nintendo Switch’s upcoming fighting game Arms offers much more than battle slinkies. Its wild maps might be its best asset. 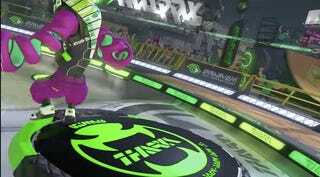 Right now, I’m obsessed with Arms’ Snake Park map, where you can glide on hoverboards and punch people in the face. It’s the Arms character Kid Cobra’s map (ha ha—get it?). He’s a skateboarder and videographer, and in the map’s background, his friends record videos of your fight. Snake Park is a circular map bordered by a skate ramp and some spectator stands. Inside, four hovering platforms rest on the ground, which is curved like a skate park’s. The map’s neon green theme is killer—the whole thing is like something out of a ‘90s Nickelodeon game show. When you step on a hoverboard, it lifts up in the air. Maneuvering it is as easy as moving the joystick in any direction. When you hit the “jump” button, the hoverboard goes up higher, giving you a height advantage. It adds a fun dynamic to the fight because when you knock a player off a hoverboard, they’re not severely disadvantaged, but they don’t have the same mobility as you. The map’s vibe reminds me of Splatoon’s—futuristic skater meets urban cityscape. It also has a ton of small details. Billboards in gibberish fill the map’s background. There are twisting skyscrapers and cranes. Part of the map takes place under a huge highway. In the arena’s stands, weird creatures jump up and down. Adding to that vibe is Snake Park’s soundtrack, a brassy funk with some corny synth bits and slap bass. Arms is out June 16th. You can look for our review then.